In the “Justice” episode of the television series Star Trek: The Next Generation, the starship Enterprise crew investigates the culture of the newly discovered humanoids, the Edo. Edo society is virtually free of crime and maintains only a small group of “mediators” to serve as what we would call peace officers. Each day, the mediators randomly and secretly designate a “Punishment Zone”. Anyone caught breaking any law within the Punishment Zone is subject to the death penalty, without exception. Since no one knows where the Punishment Zone is on any given day, the system deters people from committing any crime, anywhere. The youthful Wesley Crusher is among the Enterprise landing team members. He accidentally crashes into a greenhouse that happens to be in the Punishment Zone; consequently, Wesley is sentenced to death for destruction of property. The Edo dismiss the fact that Wesley is a visitor who is unfamiliar with their laws, and assert that ignorance of the law is no excuse, prompting one Enterprise officer to ask on Wesley’s behalf, “When has justice ever been as simple as a rulebook?” I would add that just laws should be based on common sense so that the unwary can reasonably expect to avoid illegal activities while going about their normal business. I’m a long-time resident of Utah, licensed to ride motorcycles for years, but I admit my ignorance about state helmet laws. Trusting that the laws must be at least rational, I put a bicycle helmet on my 8 year old son Evan while I donned an adult-sized motorcycle helmet, and we rode out on my Vespa scooter for a 3 mile trip into town. On our way home, we were pulled over by a city police officer. I was cited for violating Utah’s helmet safety law that requires minors on motorcycles to wear DOT-approved helmets. Just as the officer was issuing the ticket to me, a family of bicyclists zipped past us, all wearing bicycle helmets like Evan’s. I accepted the ticket without comment, but on the ride home and afterwards, I couldn’t help feeling like Wesley in the “Justice” episode. I did a little research and found that Utah has no helmet requirement for motorcyclists, except for riders 17 years and younger, and no bicycle helmet requirement. In fact, barely 19 states in the U.S. have mandatory helmet laws for all motorcyclists. Not knowing the laws, I had reasoned that, in a collision between a bicycle and a motor vehicle—even a small one like my Vespa—conservation of momentum would transfer much of the crash force to the bicycle, yet cyclists who share the street with motorists protect themselves only with the standard bicycle helmet. Thus, I had figured, a bicycle helmet should provide Evan with enough protection–at least to satisfy any common sense law. Maybe it’s just stubbornness, but I’m bothered more by the fact that my reasoning had failed than by getting a ticket! Of course, ANY law requiring helmet use is a good thing, and protecting children from preventable injuries ALWAYS should be a priority. But why do we accept the annual deaths of hundreds of un-helmeted riders and cyclists, particularly of accident-prone young adults in whom society has already invested so much, while protecting only a small group of minors beyond (my) common sense? 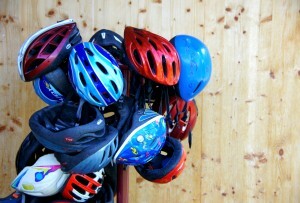 Cold-hearted economic arguments might not convince many people but they would be a better basis for rational helmet safety laws than notions of preserving personal liberties. This entry was posted in Umwelt Utahpia and tagged biking, common-sense, helmet laws, justice, liberties, motorcycles, police, punishment, safety, ticket, Utah, Wesley Crusher. Bookmark the permalink. Well give how nasty Wesley Crusher, aka Wil Wheaton, is to Sheldon he deserves the death penalty. 1. Cycle helmets are not designed to protect cyclists from collision with motor vehicles and give negligible protection in practice (they are designed to protect the head from impact with the ground at about 12mph). 2. Cycling is an activity that gives a net health and life expectancy benefit compared to risk of around 20:1. 3.Helmet laws put some people (including many women) off cycling, so actually do harm at a population level.